Perfectly positioned to catch the sunrise, and with sea views from nearly every room, the three-bedroomed Villa Abiente is an ideal holiday choice for those looking to escape the crowds. Found on Cape Yamu, this modern east-coast sanctuary features a 12-metre pool, bright open-plan living spaces, a fully equipped kitchen and lavish bedroom suites. 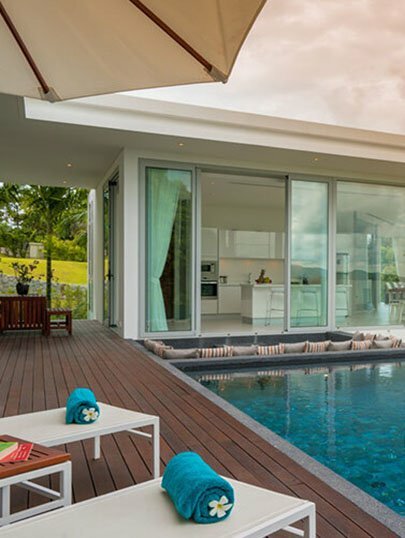 Just 30 minutes away from Phuket International Airport, Villa Abiente is among a collection of private luxury homes in the Baan Yamu estate, which also features a glittering Olympic-sized swimming pool and gym for guests, plus a restaurant and bar just a short walk away from the villa. Unlike many of its more established west-coast cousins, Abiente lies off the tourist track and retains an exclusive getaway feel. Rubber and coconut plantations dominate the surrounding landscape and traditional long-tail fishing boats glide across the bay. This is the perfect place to discover Phuket’s lesser-visited charms. Back at the villa, a stylish, bright living and dining area, incorporating a well-equipped kitchen and breakfast bar, opens to a wraparound balcony, sunken outdoor lounge and pool terrace that optimises the sea views and tropical breezes. A media room tucked behind the living area can also serve as a child’s bedroom and comes with its own bathroom. The villa’s master suite and two guest bedrooms are stylish havens with king-sized beds and private bathrooms. Two of the bedrooms are poolside and boast sea views. Guests are treated to the Thai hospitality and professional service of a team of friendly staff including a chef for all meals and a villa manager who will help arrange cars, taxis and bookings for island attractions including yacht charters around majestic Phang Nga Bay, golf tee-off times, day spas and dining reservations. Thank you for an amazing few days. We had a great time. Thank you for the delicious food and kind hospitality. We will miss the views, friendly staff and beautiful weather. Thank you for poached and fried egg. Thank you for the smile and laughter Kob, Da and staff - we will miss you all. Thank you for making our stay amazingly relaxing. The service and food has been some of the best food we have ever eaten, and service we have ever received. The Villa is a beautiful, calm, space that is exceptionally clean. It was so easy to either stay and relax or have a car organized for day trips. I would highly recommend staying here to all our friends. Thank you again for taking such a great care of us. We have a wonderful vacation in here. Thank you so much for all staff in the Villa Abiente. Thank you for making our stay here enjoyable, comfortable, and relaxing. From the warm welcome to the beautiful property and view, friendly staff and professional service. Absolutely delicious foods. We will definitely remember this trip and hope to be back very soon. Thank you for making our stay a wonderful and memorable one. The villa is awesome and love the design and view from the rooms. Food is amazing. We will definitely recommend this villa to my friends and hope to be back. Kob and chef are very nice with sweet service. We had the wonderful vacation here. Expecting to come back here next time. Thank you all! Thank you very much as you've made the last part of our holiday incredibly relaxing. You were attentive and always tried your hardest to help even with the barrier of not speaking me same language. Rooms were always tidy and comfortable. The most outstanding part of our stay was by far the food, it was delicious and such a large choice. Thank you to the 3 of you for putting up with our craziness and your amazing hospitality. We also loved our new guest. Hayden! This is the first time the whole family travelled together and we picked villa Abiente in Phuket. Service has been awesome which made our stay enjoyable for both the young and the old. Premises were well kept and clean. Ying and Kob, you are the best for taking care of us for 8 days! You are wonderful. I wish I can stay longer in Villa Abiente. Rooms are always really clean and tidy. Food is great. Ying is amazing that she can cook all kinds of nice and yummy dishes. I can swear that the best food I have in Phuket is what Ying cooked for us. This is not my first time staying in the villa that is run by Elite Havens group and their villas don't let you down at all. Always spacious and luxurious! We had a wonderful 2 days stay here. Kob and Thip are very considering and efficient. The rooms are always clean and tidy. Food are very delicious which were made by Ying. Also, all of them are patient to answer my questions. Thank you for caring. We had amazing 4 days break at villa Abiente. The property is gorgeous. The staff are friendly and accommodating. The manager is sufficient and professional. Ying and Kob are wonderful ladies and took good care of us and our stomachs. We didn't take long to feel at home here and will definitely think about returning or trying out their other properties in the Cape Residence. It's been a great pleasure to stay in this villa. The service was good, staff was nice and the house itself is just spectacular. We'd always come back if we are visiting Phuket, thank you so much! First of all, I would like to say thanks to Kob and Ying to give me such a great honeymoon beginning. During my stay the food, the environment, the services, everything matches my requirement, especially the food I like it so much. Kob always keeps the house clean and tidy. After they know it is my honeymoon, they even set up a honeymoon room which I like it very much. Hope to see you next time. Thanks for the awesome and extremely attentive services in the past three days. Our chef is amazing and she basically fulfilled all our meal requests. Food was good and perfectly presented. Another housekeeper was very helpful and meticulous toward the villa cleanliness and tidiness. All in all, we had very pleasant experience and will definitely be back in the future. Thanks for making my bachelorette party an unforgettable one. My girl friends and I couldn't be more happy throughout our entire trip! We had the most wonderful time here at villa Abiente. The view, the food and the people made us feel so welcomed and at home. Wonderful memories made. Between the stunning views, gorgeous pool and beautiful grounds. The villa staff and chef ensure that our every need was catered to. From the authentic Thai food we enjoyed at home, to organizing little excursion for us (with a baby). This was definitely a holiday to remember. A big shout out to the staff who were most attentive and ensured all our needs were catered to. Also a positive experience.from the time we confirmed our reservation to the moment we left the villa. Thank you!